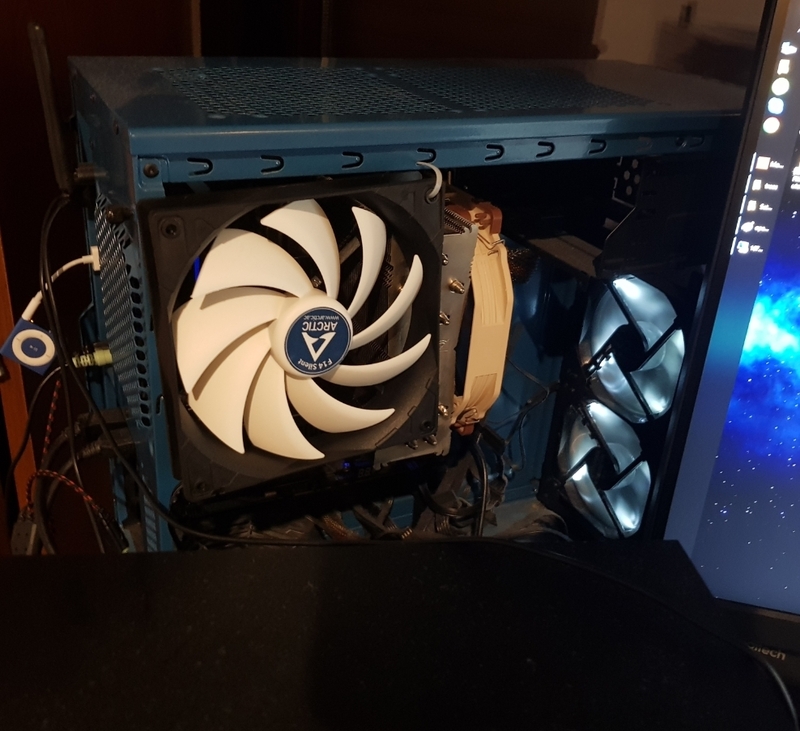 Sorry but if you can't even tell us what case you have and what fans you are using I'm not going to waste time trying to help you understand airflow and how to setup case so it cools well. Case is Fractal Design Focus G. There are 2 default fans in the front and fan on noctua. So, is it ok like this? Last edited by Juuhuu; 03-20-2019 at 10:55 AM. No, this would either make no difference or even make your temps worse. It's way too far from the VRMs to cool them and putting it above the back of the cooler like that could blow warm air back into it. I don't know what other way I could do it since noctua's fan is blowing air to that direction on the left..
You could put the F14 Silent in the DVD drive bay. Find a smaller fan to put on the VRMs. Is there even a problem that needs solving here? I just scrolled through and can't find anything that's problematic. Long term motherboard failure from capacitor wear out, exacerbated by heat. Cooling the VRMs helps even if you're not overclocking. 70mm or 80mm fan directly on VRM is best. What are the VRM temps now? All the thermals posted that I saw are really good. All the components making up the VRM are managed which is why might you get power throttling at 95c even if the mosfets are rated for 110c. The caps don't really get hot, the mosfets are the only thing that really need cooling and that seems to be taken care of unless I'm missing something here. If the VRM isn't even close the the throttle point I don't understand why you'd remove the side panel and zip tie a fan somewhere. On modern stuff even the air flow from the rads should be enough is most hardware configurations. I can understand improving case flow by getting more fresh air in and taking hot air out but the thermals are already pretty good. I'd use the intake in front of the CPU cooler or add an exhaust fan. The board the OP is using doesn't need any supplementary cooling for any stock (or likely any air-cooled OC) part it supports and you could probably expect it to last a decade and never throttle due to VRM temps even if you took off all the heatsinks and coated the VRM in spray foam insulation.